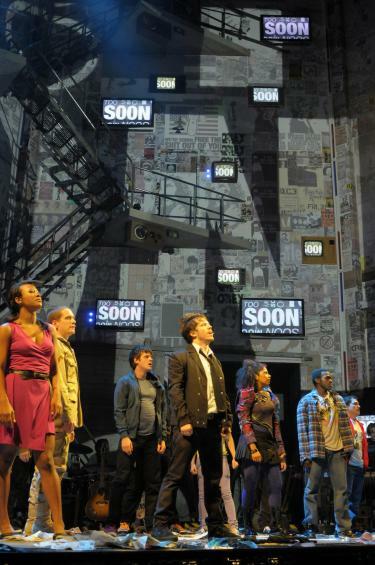 One of Broadway’s latest smash hits, American Idiot, received the honors of “Best Scenic Design of a Musical” and “Best Lighting Design of a Musical” at the Tony Awards Show 2010. The award-winning scenic elements of the show center around numerous video displays and projections, driven by a system comprising a total of 17 Hippotizer HD media servers. With a musical score based on Green Day’s album of the same name, American Idiot debuted on Broadway in April 2010 under the direction of Michael Mayer. Mayer led a creative team that included scenic design by Christine Jones, lighting design by Kevin Adams, and video and projection design by Darrel Maloney. SenovvA, Inc. implemented the designers’ vision, and provided the show’s custom video system. Twelve of the Hippotizer HDs on American Idiot are specially configured machines, outputting up to four 720p video feeds to a total of 43 Sony LCD displays incorporated throughout the set. Three more HD Hippotizers, driving Barco FLM R20+ projectors, utilize Green Hippo’s new revolutionary UberPan component to create a single, ultra-HD scenic projection. Network-based timelines in Hippotizer’s Zookeeper control software run all the video, providing spot-on and dependable synchronization of video and lighting night after night, under over-all control of an ETC Eos console. © 2000 © 2010 Pro-Light-News. All rights reserved. Thank you for visiting Pro-Light-News.